Pamela Bates received the 2011 the Peter H. Brink Award for Individual Achievement from the National Trust for Historic Preservation – announced in the Preservation Magazine November/December page 46. 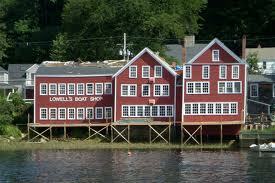 I was inspired to read her commitment to the Lowell’s Boat Shop in Massachusetts, the oldest continuously operating boat shop in the country founded in 1793. Through its different ownerships and threats by big developers – for the prime waterfront property, the building survived after Bates assembled a coalition called Lowell’s Maritime Foundation which purchased the landmark. The nonprofit took ownership in 2007 and has operated Lowell’s ever since. What I think is most dynamic about the preservation plan is it includes building wooden boats, a well-kept secret, in a working museum setting. People can actually go there and watch boat building in progress. I believe the best museums are the working museums – full of life, just like the old days when business was booming in the 1700s. Today, I acknowledge Pamela Bates for her inspiration, patience, and preservation energy. Congratulations Ms. Pamela Bates and to the National Trust for selecting a great candidate for the Peter H. Brink Award for Preservation. I hope to someday visit this property in the future and hope you will too. This entry was posted on October 24, 2011, 9:57 am and is filed under Uncategorized. You can follow any responses to this entry through RSS 2.0. You can leave a response, or trackback from your own site.